One of the cooking TV programs "Kuishinbou Banzai!" come to Tendo. They looked around in Yamagata Prefecture. At Tendo city, they recored the schene of "Imoni-kai". "Imoni-kai" is a open-air party. People cook "Imoni" pot and drink. It rains today but staffs looked like happy. October 9 (Fri.) Many swans ...? Every year many swans come to Sakata city, the mouth of the Mogami river. The Mogami river runs throuth Yamagata prefecture. Swans come not only Sakata but also Tendo. They stays river side, rice fields, etc. They says that the first swans come this year on the TV news. 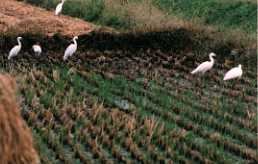 I go to the rice fields and find out white birds ! But they are herons. Yamagata prefectural goverment said that they prepare one of the base campaing of the World Cup Soccer in 2002. One of the Japanese football league team "Montedio Yamagata" uses the prefectural sports park as a home ground. We can stay there and have a spa in the park. It takes 20 minuites from the Yamagata Airport. It is very useful. Yamagata prefectural goverment have a plan of a new airline between Yamagata Airport with Toyama Airport. They make a new airline between Yamagata Airport with Hakodate Airport in Hokkaido this June. The rate of boarding recorded the highest in summer, it means that many tourists go to Yamagata, Hakodate. At the city museum of art, they have a new display about the "Craypas"(pastel crayon) from Ocotber 9. The Craypas has the character both crayon and pastel and was invented in 1925. They will display about 120 pictures from in 1920s to in 1950s this time.